As a note, I'm coming into Bride completely new, without the background of the manhwa. The drama iteration of Bride features a water god who gets transported to the human world, without his magic powers, in his quest to find the stones he needs to become the emperor of the world of the gods. 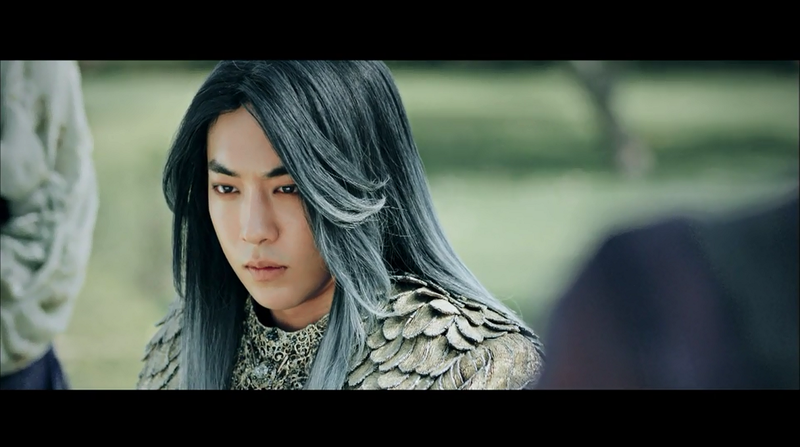 His world is an intriguing backdrop that we don't spend very much time in, though the time that we do is sufficient to see that it's a fairytale-like land of beauty, with a watercolor soft palette (though sidenote, that blue wig is so overdramatic and in line with Habaek's character). This is a director who I put full credence in knowing how to masterfully distinguish different worlds, and so far his experience is coming to good use. 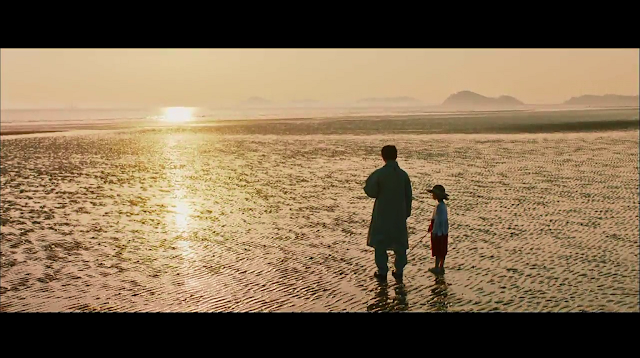 The world of the gods is shot in widescreen, and while I'm perfectly happy with human land for now, I'm curious to see what else exists in this other world, and what other great moments we might get widescreen shots of. 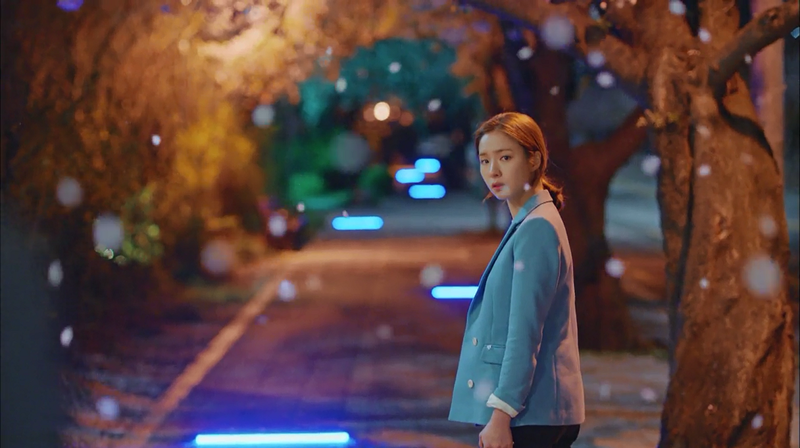 Rather ominously though, we are introduced to a future incarnation of our heroine, Yoon So Ah (played by Shin Se Kyung) in 2018, one year after the going-ons in this drama. She stands by, and sure enough, throws herself off a bridge into the water, which is when the camera pans out. I'm calling it now that our water god comes and saves her in the future, perhaps returning to Earth. My guess is also that he has to forcibly separate from her, which is why she throws herself off in the first place. It's a little melo, but I'm curious to see if I'm right. We then switch over to the present, where we learn that So Ah is a struggling psychiatrist who's short on money. Of course she is, as when has Shin Se Kyung ever played a girl who has money? It's unclear at this stage whether she's even good at her job, as her seemingly only patient throws a fit due to her apathetic method of treatment. It's unclear why she has so many monetary issues (I'm guessing it's parental inherited) and also why her practice is struggling to draw any patients. Habaek manages to get transported to this world (with suddenly short hair), where he eventually runs into So Ah, who is the descendant of the landowner who signed the agreement with the gods to become their servants. The thing I most appreciate about this show so far is its unabashed sense of humor, which was totally unexpected and a complete win. It thoroughly mines the fish-out-of-water situation that Habaek is in for all the laughs - I couldn't believe the inflatable castle and swan that the servant "prepared" for Habaek to sleep in their first night. In fact, I'm already completely won over to Habaek as a character, because his condescending treatment of his "servants" is logical and fair in his mind even as it's offensive to So Ah, and his overdramatic diatribes about his title are so ridiculous to watch. 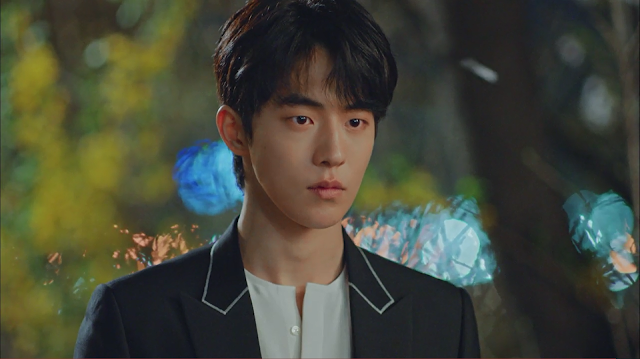 Nam Joo Hyuk, while perhaps not the strongest dramatic actor, is really appealing here in his mock seriousness, and I have to give it to the guy for making one pretty water god. I also love his relationship with his actual servant, as the pair have such adorable chemistry. At this stage, Habaek is the one who wants to make me keep watching, but that's not to say So Ah is bad. She's about the best I've portrayal I've seen so far from Shin Se Kyung, who I think should stick to lighter roles. She's the sort of actress I've always had difficulty relating with (not unlike Park Min Young), in that she's just so often stiff and single-expressioned in her acting. While again I wish we had a more effusive and relatable actress in the role, I do give her credit for leaning into the comedy and having some sparkling chemistry with Nam Joo Hyuk. I don't necessarily get tingles from seeing them together, but I do enjoy watching and am at least invested enough in their relationship to see where it goes. 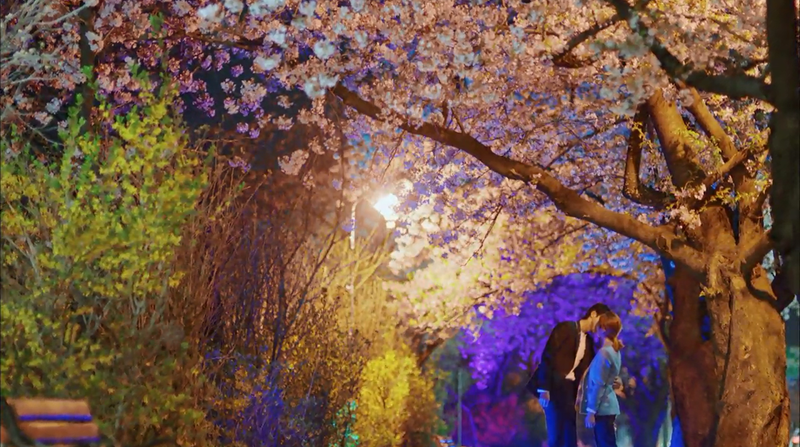 And that brings us to the episode 1 kiss - a little predictable, but also refreshing in how fast we arrived at it in a Kdrama. 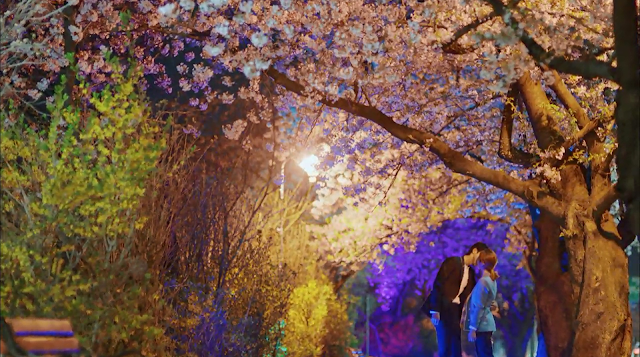 And yet another example of the incredible cinematography in this drama - the light fluttering of cherry blossoms around the character, and the perfect framing of the shots. I am in love with this director, and can't wait to see more of this show. It's so far exactly the type of light-hearted summer rom-com that I'm sure most people, me included, are in the mood for. Please just keep up the humor and keep the story flowing as it has been, and I'll be a happy viewer.